Theodor Fontane in the "Walks through the March of Brandenburg"
"In Altenhof, directly on the yellow gravel banks, are a couple of fir trunks stacked, forming a high bank at a glance. And there we sit. Small Wave foam on the shore, in front of us wide water surfaces are in the light, while bluish northwards are shadows of the forest and lakes wide. Thither also the ruins of the old semi Sage become Grimnitz castle ... ... It is a fairy tale place where we sit, as we sit on the banks of Werbellin ... "
In the communist era much of the forest area were cordoned off and served the SED leadership as large-scale state hunting ground with diverse "recreational objects". On Werbellinsee one can find Erich Honneckers' "hunting lodge Hubertusstock" and Margot Honneckers "pioneer Republic Wilhelm Pieck" (today European Youth Meeting Place "EJB"). A few kilometers away is Erich Mielke's "hunting lodge on Grimnitzsee" (now Rehabilitation Clinic for cardiac patients). The "SED Gästehaus am Döllnsee" (now a hotel with a commendable Lake Sauna) was built in the 50's opposite Hermann Goering's "Carin Hall" (which was blown up in the last days of the war by the Wehrmacht). In Joachimsthal, the "Kaiserbahnhof" station (especially built for Kaiser Wilhelm and his hunting parties) has been renovated and transformed into a "radio play station". And Wandlitz, the ghetto of the DDR-powerful, is just around the corner. 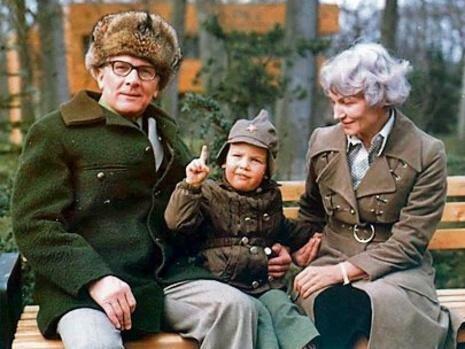 What remains are the legends of the "Waidmänner" Herrman Goering (of Carin Hall treasure in Werbellinsee), Leonid Brezhnev (the bear hunter), Willi Stoph (the enacted Dear), Erich Honecker (the Romanian shotgun), Erich Mielke (the wild boar, who was a rabbit), Berthold Beitz, Franz Joseph Strauss and Alexander Schalck-Golodkowski ( "... then we meet again on lake Starnberg ..."). The former "FDGB Ferienheim 'Werner Lamberz' the working people of VEB Gummikombinats Waltershausen/Tambach Dietharz was built in the 70's from a stall (wing) and a barn (the main house). The front House at Joachimsthaler Str. 3 and 4 was built in 1860. It was probably the 3rd house of the Altenhof fishing village, at the time. Until 2006 the Werbellinsee's fisherman lived at the property at Joachimsthaler Str. 3. Today the fishing rights belong to the Fischerei Wolf at Seerandstr. 17, in Joachimsthal (0333-382150), as the"Old Fishery" Kiosk and restaurant in Altenhof no longer sell fish from Werbellinsee. The mother of the current tenant of the semi-detached Joachimsthaler Str. 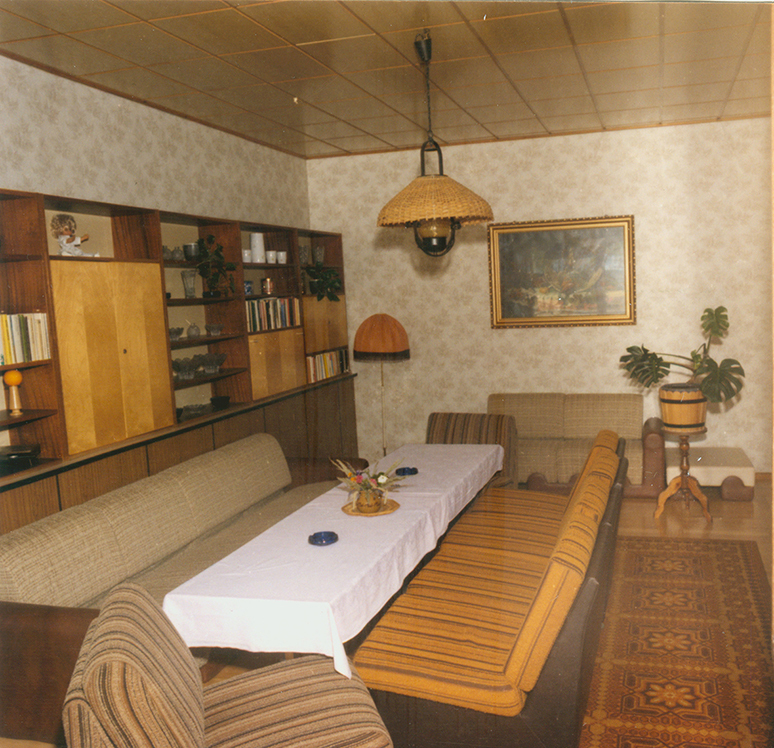 4 sold in 1966 the house (Parcel 73), inherited from his father, which then extended to the promenade, to the "VEB Gummikombinat Thüringen in Waltershausen". After the new owner had agreed continue to lease to parcel the four small bungalows - Lands 203 and 206 (Legal Description 1975), he was allowed to build a working holiday home on the remaining parcel 207. In a letter dated 10.17.1974 of the "council of the district of Eberswalde, Department Transportation, Environmental Protection and Water" it is written, "... I can provide you with the Council of the district permission to use said object for operating recreational purposes .... as announced by the comrades Zimmermann, the territory Altenhof or county Eberswalde can not provide you with any financial and/or material means for expansion. I ask you to consider this. For the realization of your project, I wish you and your workers every success. with socialist greetings .... "
In July 1975 the "Gummikombinat" submitted a planning application. The "structural Explanatory Report" states that "the object consists of a former barn and a side building. The shell and roof of the building is essentially maintained.". The first assignment with guests took place from 20.7. until 02.08.1976, with six families (12 parents and 12 children). 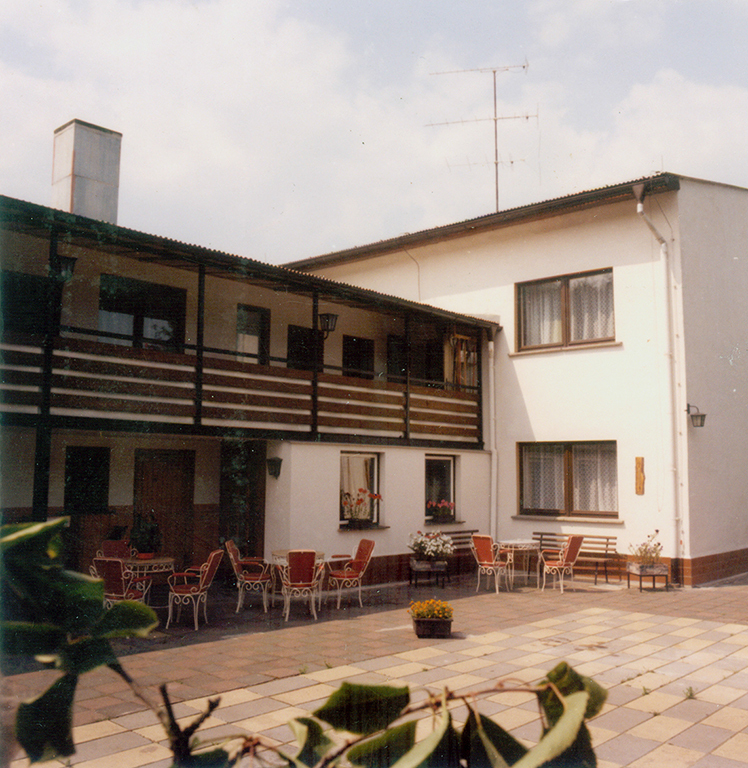 From 1978, working people from Czechoslovakia (now the Czech Republic) stayed as guests in "holiday Altenhof am Werbellinsee VEB GKT Waltershausen BT OG Tambach Dietharz" yearly. 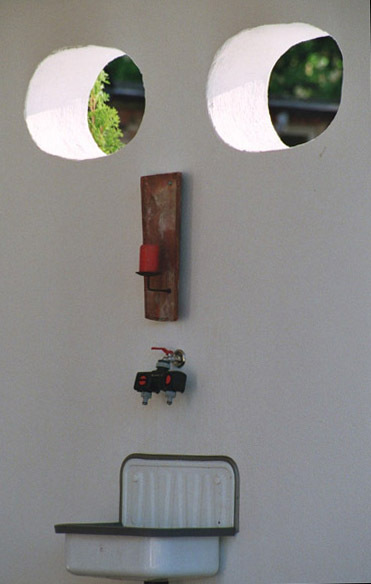 It is believed that at least until September 1991 a regular holiday home operation existed. 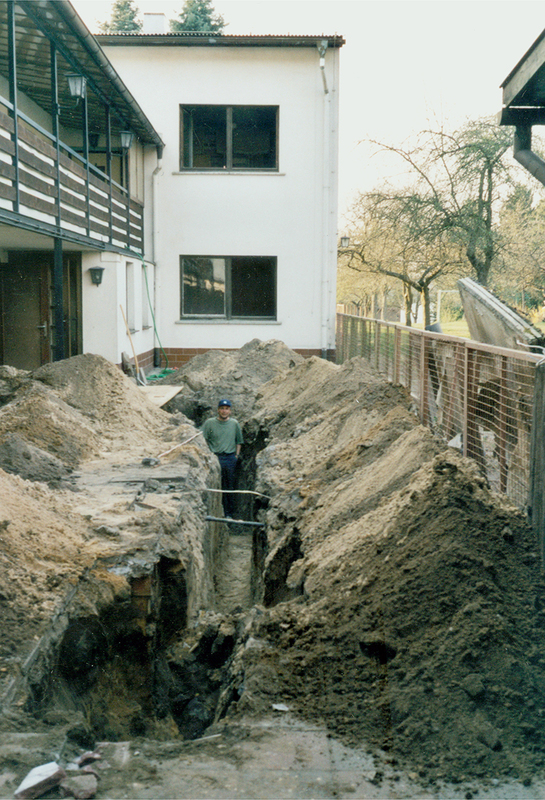 On 8.4.1997 "following a request from the Presiden of the Bundesanstalt für vereinigungsbedingte Sonderaufgaben in Berlin" to the "Treuhandliegenschaftsgesellschaft (TLG) mbH in Berlin" the plot was transferred. In the spring of 1998, the four bungalow plots were sold (for 4,000 DM) each to the respective tenants due to a "priority notice ... with reference to a grant from 04.23.1996". The "TLG Immobilien GmbH Potsdam" finally sold the leftover parcel 207 in an auction, after many unsuccessful own sales efforts, through the "German Property Auctions AG". So I acquired the property in the public auction on 24.9.2002 in the Schöneberg Town Hall (the former West Berlin's city hall) and was registered on 5.5.2003 as the owner. Initially, only extensive purges, planting and clearing out, and construction to ensure the building's safety (for example, horizontal masonry insulation and drainage, window fittings, roofing, renovation of the west facade) could take place. After fulfilling various requirements of the "Lower Building Authority of the district Barnim" (including creation of extensive drawings, official site plans, obtaining "easements", the payment of "Parking fee charges" etc.) I finally got, on 29.8.2007, authorization for reconstruction and commissioning of the holiday and seminar house. Since then, further restoration work was carried out, whereby the house has been gradually transformed into a modern, comfortable and somewhat luxurious cultural attraction for tourists, daily and weekend-traveling Berliners and the region's inhabitants. (good and truthful), haus arton® stands by these words. Anyone who wants to relax for a few days - alone, with a partner or family - whether to unwind or to celebrate a special event with friends - is welcome here. We want to be there for you and make sure you enjoy your stay with us. For professional reasons, I have been to many hotels and for this house I have decided to go for beautiful but simple ideas, with no "bells and whistles". No gold taps but well-lit rooms, with wooden floors and mud-plastered walls; lovingly, individually and practical. Enjoy our house's harmonious atmosphere and the beautiful nature around the lake Werbellinsee in Schorfheide.